I cannot get enough of graphic tees at the moment, the are so big this season and everyone seems to be wearing them every where you look! Especially THAT gucci tee, that did the rounds on social media and man was it really nice, but the price tag however was something I and I'm sure many weren't willing to pay. That's why on many of my scouring the internet moments this fell into my life, I saw it. Went to town and nabbed it and boy am I glad I did. At the moment it's currently saying it's all sold out online but I'm sure there are some still in store, well there was in my local Topshop when I took a visit last week. But hopefully if you're persistent enough one will pop up because if it's not already I think this will be all over the blogosphere in no time. I decided to team it with my denim skirt, which by the way topshop can we have a little more material please the horror of realising your bum is on display and having to use your jacket as a tie around to cover up is not very chic! Pairing it with my trusty belt and there you have it. This belt I add to pretty much every outfit I really think it just pulls the whole look together, any look for that matter. I'm actually currently on the look out for a gucci belt dupe to change up belts now and again so if any of you have found one let me know where! 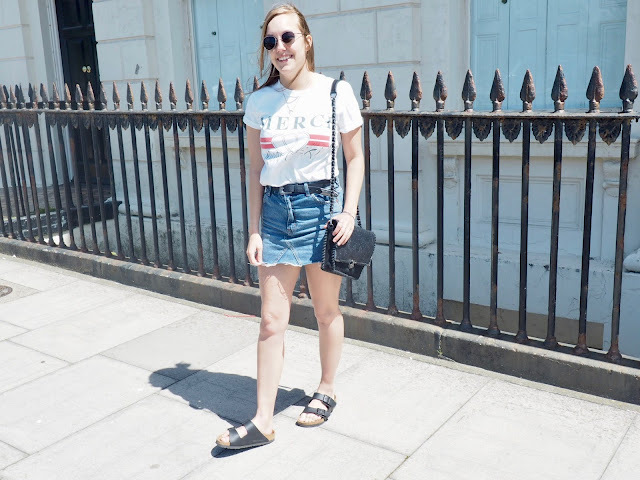 I love a good dupe and that's what my space aims to be a place where people can come and relate to the outfits as they are at a price range that most of us can afford. Don't get me wrong I love a good designer and seeing what other bloggers are getting and I mean who wouldn't want a the latest designer handbag. But right this moment not all of us can and a lot of us are just happy with the dupes and so that's what I aim to do, style affordable outfits for most if not all my readers and help you find those dupes so you too can recreate those high end looks but with a small price tag! Photography by my lovely boyfriend. Love how you've styled this outfit, that denim skirt with the graphic tee is always such a classic combo! Thanks Chic! I am obsessed with this tee! I really like how you styled it with the shoes, the belt and this skirt is amazeballs ! Hi there - just seen this and thought you’d like to know about a new shopping linky that has been launched at http://www.homeandhorizon.com/snapped-linky-june-july/ - would love you to link up your post so others can check it out and comment - Thanks, Lauretta p.s. Let me know if you have any questions!